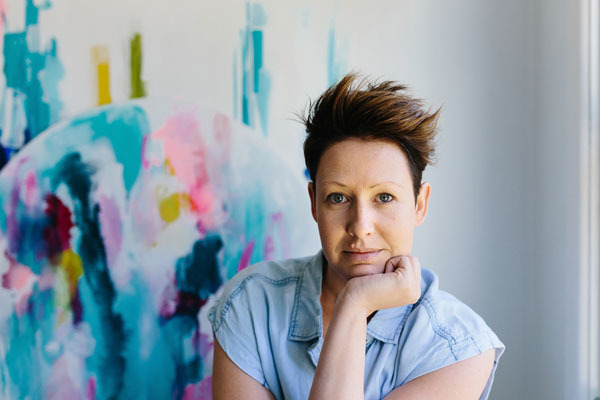 One of the reasons we love Australian-based artist Maggi McDonald is that she leaves the fate of her works to the movement of the paint and the patterns they make on canvas rather than solely trusting the paintbrush. 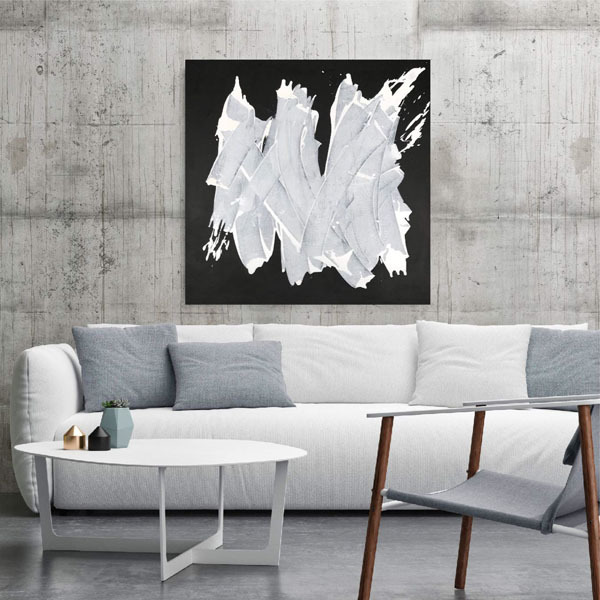 The abstract artist’s large Instagram following and diverse and international clientele make it hard to believe that she has only been professionally creating art for the past four years. 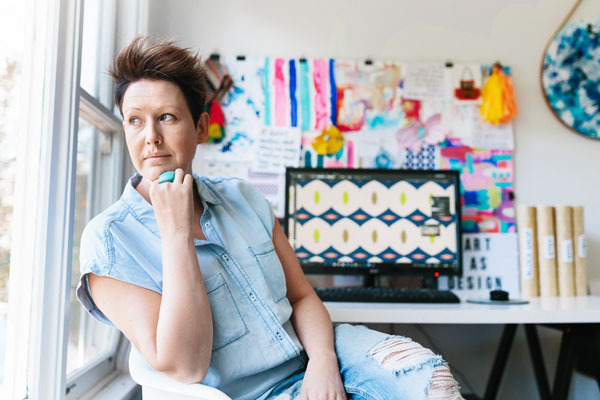 A Cape Town, South Africa native, McDonald grew up in a creative household, with memories of her mom, who was a potter, making jewelry and macramé. 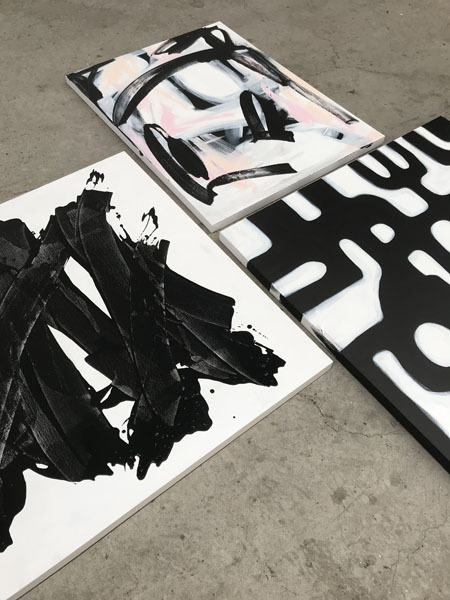 Although she studied art as a school subject and did projects with her mom, McDonald never thought she would make a career as a painter; she initially studied languages, translating and editing. At 21 years old, McDonald left South Africa and headed for London, where she lived for five years and met her Aussie husband. McDonald and her husband settled down in Australia about 16 years ago. McDonald began working in retail management at a department store; it was different from her prior work experiences, but she loved working with people and still loves to do so. McDonald went on to have a child, and life took its course. She was going through some tough personal matters that led her to have an “aha moment,” that life is too short to do something that doesn’t make you happy. McDonald realized that whatever her calling was, it was going to involve her using her hands. She decided to go back to school and study design, but after taking a design course for one year, McDonald realized that she wanted to start painting again. And that’s exactly what she did. She started to post some of her works on Instagram and even sold some paintings to friends, most of whom gave her art away. Everything else fell into place shortly after. McDonald ended studying for another year, focusing on surface design: textiles, wallpaper and pattern design. It was at this time that her painting career really started to take off. It has been four years now, and an incredible life journey for McDonald. Often, artists struggle to get off the ground running, but McDonald learned early on that to be successful, an artist needs to diversify and explore different avenues of passive pay. McDonald does not just paint all day; she manages a business as well, updating her website, doing things like interviews and podcasts, and behind-the-scenes administrative tasks. Though there are times where she can spend hours on end in the studio, it essential for McDonald and artists, in general, to step back and take time away from undergoing projects. McDonald finds inspiration in almost everything, from nature to man-made structures. Unlike most artists who have a very distinct vision in mind from the get-go, McDonald only needs a color or a palette and sees where the paint takes her. McDonald’s favorite part about her job is “being able to see her works all over the world.” Technology and Instagram have played a significant role in the artist’s success; as they allow her to share visuals with fans and clients of her work. Screen printers, interior designers or store owners, and people who want an original piece of art can easily go on McDonald’s website and buy her works. She recently had a Skype call with a couple from Beverly Hills, California, so that they could see the art in person. We can’t wait to see what else the abstract artist has in store.